These charming baby ferns have a very short season, usually starting in early spring when young plants are growing new leaves. They are tightly coiled in their youth, and if left unharvested, would bloom into new fern fronds. 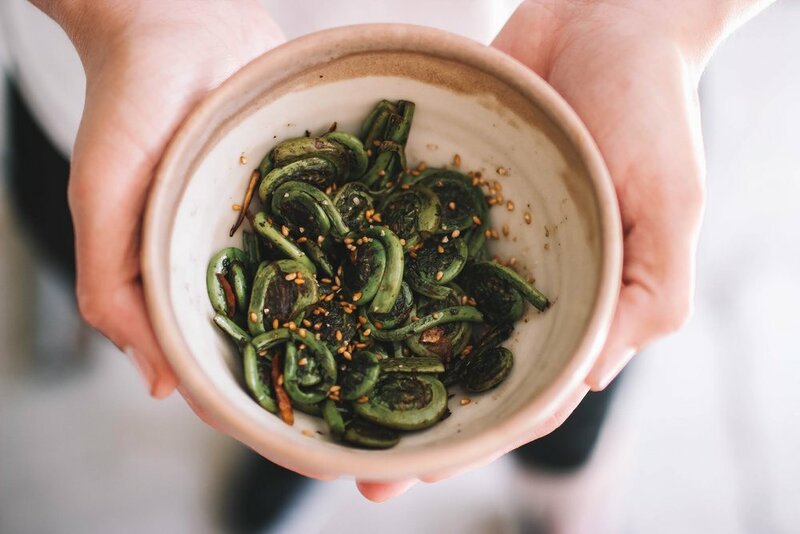 Fiddlehead ferns taste similar to asparagus, with a hint of spinach. They have a unique texture, somewhat crunchy like cauliflower or, oddly enough, shrimp (in texture only!) Some people say they taste a hint of nuttiness, mushroom or artichoke. Alongside the richness of morels, their spring time companions, they will exude a greenbean-like flavor. FIddlheads are very easy to cook! We don't recommend eating them raw - they should always be cooked. You can think of them the same way you think of asparagus: saute, steam, boil... it's all delicious! We like them with butter and alliums like onions, garlic, and shallots. If you're foraging, make sure you bring an expert along with you! They pair well with light cheeses like buratta, make an excellent pizza topping, and work delightfully in French dishes like omelettes with hollandaise sauce. Because they have a short season, many people will pickle them for use in salads, sandwiches, or as a side dish. If you're looking to add a new veggie to your vegan, paleo or keto diet, these are the unique ingredient for you!